Montana Black Artist Edition FELIPE PANTONE Infra Red IN300 This limited release Montana Black can features a label designed by FELIPE PANTONE, a Spanish-Argentinian muralist acclaimed worldwide for his mind-bending aesthetic. He chose to fill his can with shade 3000 INFARED, a bold neon red featured in many of his graffiti pieces and murals. 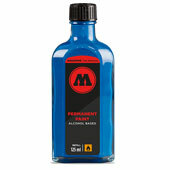 Montana Black Artist Cans are a standard 400ml size. This limited release Montana Black can features a label designed by FELIPE PANTONE, a Spanish-Argentinian muralist acclaimed worldwide for his mind-bending aesthetic. 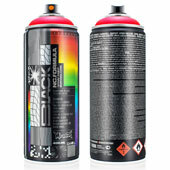 He chose to fill his can with shade 3000 INFARED, a bold neon red featured in many of his graffiti pieces and murals. Montana Black Artist Cans are a standard 400ml size. This product was added to our catalog on Thursday January 17, 2019.